With the flurry of Geforce 9600GT's hitting the streets, there really are a lot of different videocards to consider. If you've been pondering an upgrade, don't fret. Many of the new Geforce 9600GT's are based on the reference videocard, and this makes it really simple to comparison shop by price alone. A few models are pre-overclocked above the stock GPU and memory clock speeds, while others are based on custom PCB designs that accommodate a physical HDMI port at the back of the card. Of what's available, the choice basically boils down to 9600GT for gaming, or a 9600GT that's a little better suited to for home theatre applications. We think home theatre is going to play a very large role in many consumers' computers, so don't underestimate it now. As to pre-overclocked or stock-clocked videocards... well, the Geforce 9600GT is pretty forgiving so I think both options are equally valid. If you don't want to bother overclocking yourself, aim for a pre-overclocked videocard like the Foxconn 9600GT-512NOC PCSTATS is testing in this review. This baby is a single slot reference videocard which has been pre-overclocked at the factory. Foxconn's 9600GT-512NOC retails for about $195 CDN ($195USD, £118 GBP), and comes with bare minimum. I think most consumers would agree that it's better to pay less than have a couple bundled video games thrown in. As with the Palit 9600GT Sonic, Foxconn has pre-overclocked this Geforce 9600GT from the stock clock speeds. The nVidia GPU runs an extra 50MHz quicker, the memory is up 100MHz, and the shader clock runs 125MHz faster. There's a lot to like about a mainstream videocard like the Geforce 9600GT, and it'll be interesting to see how much further we can overclock this particular Foxconn card. Foxconn's 9600GT-512NOC is equipped with 512MB of GDDR3 memory, is DirectX10 and Shader Model 4.0 compliant, supports nVidia SLI, and is PCI Express 2.0 and HDCP compliant. The maximum supported output resolution through each of the two dualink DVI outputs is 2560x1600 pixels. A dongle cable facilitates connections with an external display over Component Output/Composite/S-Video. User's Manual, Driver CD, Driveclone3, (2) DVI to analog converters, SLI 6-pin power cable, component output dongle cable. 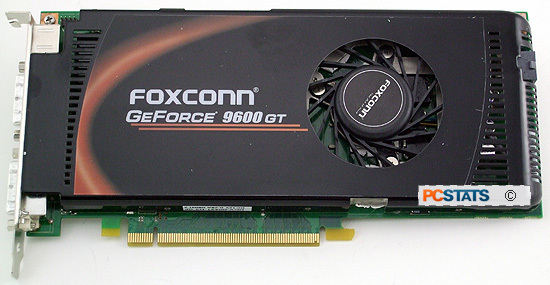 The Foxconn 9600GT-512NOC videocard is based on the nVidia reference card layout and uses the stock single-slot thermal solution. The reference heatsink is quiet much of the time, but can become loud when the card is running stressful 3D benchmarks. The card measures 22cm long and requires one 6-pin auxiliary power connector. The extra power connector is a big step up in power requirements for a mainstream-oriented videocard. If your power supply lacks this connector you can use two molex plugs with the included adaptor cable. 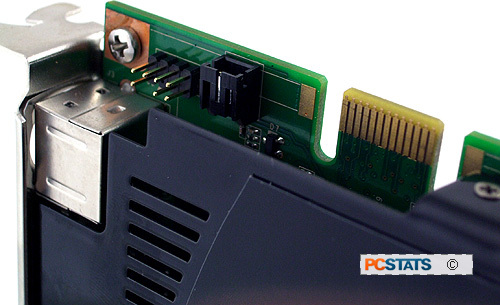 At the top left hand corner of the videocard you'll see the SLI bridge connector which allows you to run the Foxconn 9600GT-512NOC with one other GeForce 9600GT videocard in SLI mode. As with most mainstream videocards, the accessory package is nothing to get excited about. In the box you'll find two DVI-to-analog adaptors, a component output/s-video/composite video output dongle cable, and a molex-to-6pin power connector. The three video formats make connecting one's PC to a big screen television an easy enough task. However, like the Biostar Geforce 9600GT videocard PCSTATS recently tested, the Foxconn 9600GT-512NOC also lacks a DVI-to-HDMI adaptor. HDMI is much more convenient way of sending video to a big screen, and the image quality is better too. It's surprising more manufacturers are not including such a basic component with their Geforce 9600GT offerings. Curiously, the Foxconn 9600GT-512NOC ships with a copy of DriveClone3 and VirtualDrive 11.5 software. 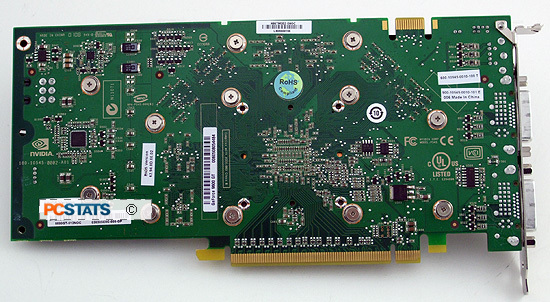 The Foxconn 9600GT-512NOC videocard has a digital 2-pin audio header at the top right corner next to the SLI connector. This is used to input audio to the videocard, so it can output audio over an HDMI cable (if using a DVI-to-HDMI adaptor). The appropriate motherboard SP/DIF audio jumper cable is not included. The reason for this audio jumper is that nVidia's graphics cards do not incorporate an audio codec. The audio signal needs to be connected to the videocard manually, whereas ATI solutions have a built in codec so jumper cables are not necessary. A quick look at the NVidia Geforce 9600GT core is next, and then PCSTATS dives right into the overclocking!